*High quality fabric with exquisite workmanship,and comfy wear,simple design maxi long dresses for women, casual loose style dresses can paired with a coat, choker and heels, or wearing them alone is a wonderful idea as well,a must have in your wardrobe. *Soft and comfy, and fit for summer. Simple but fashion style dress. 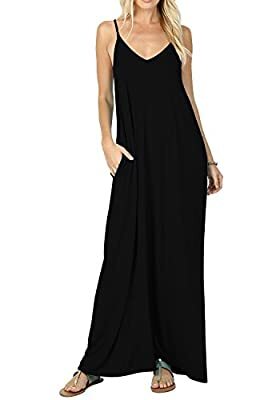 *Pattern Type: Solid color,Rounded neckline high waisted design; casual plain simple flowy loose long maxi dress with two side-seam handy side pockets, pretty discrete and blend nicely with the dress. *Small(US 4-6) Bust: 82cm/32.28"; Length: 136cm/53.5"
*Medium(US 8-10) Bust: 88cm/34.65"; Length: 137cm/53.9"
*Large(US 12-14) Bust: 94cm/37.00"; Length: 138cm/54.3"
*X-Large(US 16-18) Bust: 100cm/39.37"; Length:140cm/55.1"
Material:95% Rayon, 5% Spandex,soft and comfortable US Size:Small-US(4-6);Medium-US(8-10);Large-US(12-14);X-Large-US(16) Features:casual style,cami slip dress to adjust the length of the cami,floor length,loose, Match tips:shirt/sandals or other types of shoes/jackets/beach hat You can pair a belt and jacket with it,a different beautiful look will occur.Perfect dress for casual,pregnancy,wedding,party,vacation,streetwear,cocktail,daily life.